MALCOLM Allison, one of the pivotal figures of the 1970s, once said that the period between 1967 and 1972 was one of British football’s golden ages. Anyone who lived through that half decade of action will doubtless recall some outstanding players and personalities, memorable teams and the outlandish fashion and hairstyles of the age. This was, after all, a period that desperately clung to the “swinging Sixties” and introduced the excesses and decadence of the early 1970s. It was played out against an economic background that was deteriorating weekly, culminating in the candle-lit days of power cuts in 1973-74 and the three-day week. From a footballing perspective, England still had enough self-confidence to believe that Sir Alf Ramsey’s squad was still capable of competing at the highest level. 1971 was just five years after the 1966 triumph and some of its key figures were still stubbornly hanging onto their place in the national team. But if the end of the Sixties, from a cultural point of view, was signalled by the break-up of the Beatles, 1971-72 really killed-off the period with the decline of England, the ageing of some of its icons and the conclusion of the post-66 attendance boom. 1971-72 was two years on from the last football season of the 60s, but football’s two standard bearing groups of the decade – Best, Law, Charlton and Moore, Hurst, Peters, were coming to the end of their time of influence. By the end of 1972-73, the Manchester United trio were no longer at Old Trafford, for various reasons, and only Moore was still at West Ham. The 1971-72 season looked like the final flourish of the man that epitomised the 1960s, George Best. He scored 26 goals in domestic football and provided some brilliant football, but it was the last we saw of the genius that was the Irishman. As Manchester United declined in the second half of the season, Best lost heart and by the middle of 1972-73, he had retired. United’s fall from the pinnacle of the game really started in 1970 and their impressive first half of 1971-72 merely papered over the cracks. Within two seasons, they were relegated, although in hindsight, it was the short, sharp shock the club needed to acknowledge that things had changed since the days of Sir Matt Busby. Even without United, though, English football served up an exciting championship race, possibly the most tense and open for years. Arsenal went into the campaign as double winners in 1970-71, but they were never really involved in a bid to retaining their title, although they returned to Wembley for the FA Cup final. However, Arsenal’s pursuit of European success suggested that there was a degree of stagnation settling in across English football. In 1970, when the Gunners won the Fairs’ Cup, they beat Ajax over two legs with some ease. Two seasons on, Arsenal were beaten twice by the Dutch team, who were holders of the European Cup. Something had changed and the spirit of progressive football wasn’t to be found in England, it was across the Channel. The Dutch, with Johan Cruyff in his pomp, may have been leading the way in club football, but the West Germans had emerged as the team to beat on the international stage. There were signs that an irresistible force was in the ascendancy in Mexico in 1970, but in 1972, the Germans were European champions and they had signalled the end of Ramsey’s England in the quarter-finals, winning 3-1 at Wembley. West Germany had their own dynamic playmaker to rival Cruyff in the form of Günter Theodor Netzer, and he made England’s own midfielders look very pedestrian. That tie was, effectively, the end of Geoff Hurst – he left West Ham in the summer of 1972 – but also struck at the heart of English confidence. In terms of self-confidence, Derby County’s outspoken manager, Brian Clough, had few equals, although his style wasn’t to everyone’s taste. Nobody predicted that Derby would become genuine title challengers, although Clough had assembled an exciting team at the Baseball Ground. 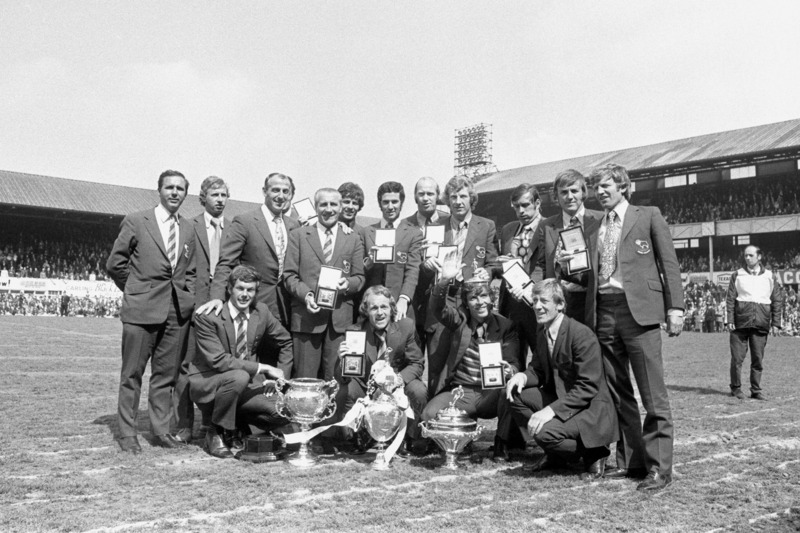 Leeds United, who had become serial bridesmaids in 1970 and 1971, were most people’s idea of champions, although they remained unpopular. Don Revie had instilled in his squad something of a siege mentality, largely built on the “us and them” philosophy and the desire to create intense loyalty and togetherness. It worked, but Leeds never had the strength in depth required for a campaign fought on multiple fronts and accompanying their intensity was high drama – a Leeds defeat was invariably greeted with schadenfreude by the rest of English football, which only served to bond Revie’s troops even closer. This often clouded the fact that Leeds were a extraordinary footballing team and in 1971-72 they produced some of their best performances. They won the FA Cup and were beaten at the death by Wolves in their final league game when the double was at stake. Once more, they had fallen short at the final hurdle. Returning to Malcolm Allison, his Manchester City team had the title within their grasp, but to some extent the signing of Rodney Marsh, the coveted Queens Park Rangers forward, cost City the title. Signed in March 1972, for a record £ 200,000 fee, March joined a team that was four points clear at the top of the table. Marsh himself admitted that the transfer was a mistake and that it had been detrimental to City’s championship credentials. While Marsh, despite his skill and charisma, upset the shape of Allison’s team, a new and relatively unknown forward had injected fresh impetus into Bill Shankly’s Liverpool. His name was Kevin Keegan and he would become British football’s hottest talent and the successor to George Best as the face of the game. Keegan was a different proposition to Best, though. He didn’t have Best’s natural virtuosity, or his maverick tendencies, but he made the most of his attributes and he knew his worth. Keegan was wholesome, reliable and energetic and Liverpool’s Kop loved him. Liverpool were one year away from beginning their ruthless pursuit of silverware, but in 1971-72, they had enough to finish painfully close to the top spot. That belonged to Derby County, but not before no less than four teams stake a claim to the title, right up until the final week. Derby were, perhaps, the least likely to finish in first place, but there could be no denying the quality of their football. Players like Roy McFarland, Colin Todd, Archie Gemmill, Kevin Hector and John O’Hare would become household names, while Clough, with his emphasis on skill and hard work, would go on to prove that his success was no fluke. The party was not quite over, but the guests were gradually leaving. Within a decade, attendances in division one had fallen by 10,000 per game. Clough left Derby in 1973-74, Allison resigned from City, Revie took on England in 1974 (after a second title with Leeds), Shankly retired in 1974. United were relegated, Chelsea followed them in 1975 and Tottenham lost that doyen of managers, Bill Nicholson. And to cap it all, England failed to qualify for World Cup 1974 and Ramsey was sacked. In 1971-72, who would have predicted such a chain of events, even in the unpredictable world of football. As a nine year old Leeds Utd fan having been on top of the world on the Saturday with Coleman’s words ‘Clarke one nill!’ very much sweet to my ears, the following Monday night I cried myself to sleep, as the heartbreaking news came through on my transistor radio that Wolves had upset the apple cart at fortress Molineux and denied Revie’s charges the coveted double! Enjoyed your article and thanks! Previous Entry Football Read Review: The Barcelona Legacy – the story of our footballing time?